Phytophotodermatitis connotes phototoxic reactions consisting of erythema (with or without blistering) and delayed hyperpigmentation. Phototoxicity implies an immediate or delayed inflammatory reaction caused by the combination of a topical or oral photosensitizing agent followed by the appropriate wavelength of ultraviolet radiation (UVR) to the skin.37 This response can occur in any person who has been exposed to adequate amounts of a photosensitizing chemical and UVR. It is therefore not an immunologic reaction, and no prior sensitizing exposure is necessary for any potential victim. Although monoadducts may produce mutations, inhibit DNA synthesis and cell proliferation, stimulate melanogenesis, and cause cell death, these effects are greater with cross-link formation. The only monoadduct formation that can cause significant phototoxic bullae is that formed by pimpinellin, an angular furocoumarin found in Heracleum spp. Only the linear psoralens can form bifunctional, interstrand cross-links, and these cross-links to keratinocyte DNA are the main chemical change responsible for severe skin damage after UVA. While oxygen-independent psoralen reactions cause the most cellular damage, oxygen-dependent (photodynamic) reactions also cause clinical effects. Reactive oxygen species form by the interaction of psoralens and oxygen. These occur in cell nuclei, in cell membranes of epidermal, dermal, and endothelial cells, and in cytoplasmic constituents such as enzymes, RNA, and lysosomes. Psoralen-induced hyperpigmentation occurs via a multitude of interrelated changes. After bifunctional photoadducts are formed in keratinocyte and melanocyte DNA, increased mitosis of basal layer keratinocytes and melanocytes is observed. In fact, the melanocyte population will double or triple within 3-7 days. Melanocyte hypertrophy and increased arborization is also seen. Tyrosinase activity increases to make more melanin that is packaged into an increased number of melanosomes found in melanocytes and transferred to malpighian layer keratinocytes. In fair-skinned individuals, the distribution of melanosomes changes. Instead of small, clumped melanosomes in keratinocytes, large, single, dispersed melanosomes are seen capping the nuclei. This pigmentation can last for months or years. Non-psoralen photosensitizing chemicals have been isolated from members of the daisy family (Compositae): polyacetylenes (such as phenylheptatriene) and thiophenes (such as a-terthienyl). However, phytophotodermatitis after contact with members of the Compositae have never been reported. Therefore, it is likely that these phototoxic compounds do not contact the skin in high enough concentration or that they do not penetrate the stratum corneum. Figure 18: Clinical and Pathological Characteristics of Hypersensitivity recation. Four main plant families have been implicated as causing phytophotodermatitis: Umbelliferae (Apiaceae), Leguminosae (Fabaceae), Moraceae, and Rutaceae. Bergapten (5-MOP), followed by xanthotoxin (8-MOP), are the most commonly found linear furocoumarins in phototoxic plants. Psoralen is uncommonly found or is found at low concentrations. The angular furocoumarins such as pimpinellin, angelicin, and sphondin have a much smaller contributing effect to phytophotodermatitis. 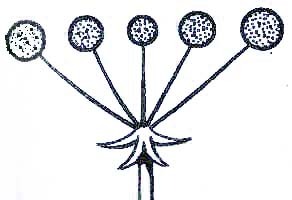 Often, the flower heads are made up of many small umbels to make 'compound umbels (Figure 22).' When fruits are present, they are small, oblong or cylindrical. The flower heads are sheathed at the base by one or more leaf-like bracts. The various family members look so similar, that precise identification of species can be confusing. 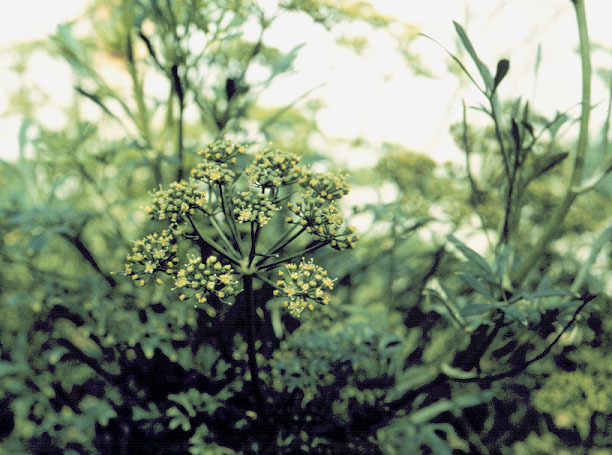 Ammi majus is the world's major source of xanthotoxin (8-MOP). It has been found naturally in Egypt's Nile valley, Europe, India, Russia, the United States, and South America.1 Furocoumarins are especially abundant in roots and leaves of the Umbelliferae. Historical and economic importance: 2000 BC vitiligo treatment. Major source of 8-MOP. Heracleum sphondylium, cow parsley, is thought by some to be the major cause of phytophotodermatitis in Europe and North America.1 Once introduced into a new area, Heracleum spp. tend to grow out of control up to 10 feet tall. The black seeds and leaf extract contain the most potent photosensitizers.1 The greatest threat from Heracleum occur in the autumn when the weather favors the development of many seeds.46 Hollow stems of H. mantegazzianum and H. laciniatum (Tromsø palm, Norway) used as peashooters and trumpets have caused perioral blisters in children.15 Flowers, fruit, leaves, and roots of H. laciniatum are much more phototoxic than the stems.58 Heracleum spp. contain both 5-MOP and 8-MOP. Celery harvesters and canners are at high risk for developing phytophotodermatitis. Only 1mg of 8-MOP per square centimeter of skin is necessary to produce blisters after 2.4 J/cm2 (less than 10 minutes of summer sunlight in Colorado)!15 In one study of 320 randomly selected Michigan celery workers, 163 (51%!) displayed various stages of vesicular and bullous dermatitis on the fingers, hands, and forearms.59 In this study, the authors could not induce phytophotodermatitis except with celery infected with pink-rot disease (Sclerotinia sclerotiorum). The furocoumarins are often concentrated in the leaf sap and stem sap. Less than 0.1 g linear furocoumarins/100 g dried plant can elicit phototoxic reactions. The following table15,46 shows the concentrations of 5-MOP and 8-MOP in various Umbelliferae members. According to Lovell,15 no true photoallergic reaction to plants has been proven except perhaps one case from contact with Parthenium hysterophorus (Compositae).63 However, Kavli et al. reported the induction of photoallergic contact dermatitis to Heracleum laciniatum.64 Lovell comments that the sensitizing agents in this case were poorly phototoxic constituents such as isobergapten and sphondin.23 Pathak has stated that the contact photoallergic reactions reported by Kavli et al.64 were erroneously attributed to psoralens.1 Kavli et al. 46 point out evidence from Ljunggren65 that a patient who had a long history of phytophotodermatitis developed a different eruption associated with itching and histologic perivascular lymphocytic infiltrate with lymphocytic spongiosis. This was elicited by psoralen concentrations 1/1000 of that necessary to cause his usual phototoxic reaction. From this, one may conclude that photoallergic contact dermatitis is at best rare and is certainly still debated among experts in botanical dermatology.